For being such a big ole’ scardey cat, I sure do love some vampire themed shows. First I was obsessed with Sarah Michelle Gellar and the rest of The Scooby Gang from Buffy The Vampire Slayer. Nothing came between me and my beloved Buffy, I mean nothing. Once the apartment complex I lived in decided to cut corners and get some bootleg cable service for the entire complex that didn’t pick up the WB. Next day my bags were packed and my lease was terminated (It was Season 3 y’all, the one with Faith!). I enjoyed the Buffy spin-off, Angel with David Boreanaz. And I adore the Salvatores from The Vampire Diaries on the CW. I almost lost my mind when our friends at HBO and Time Warner Cable came to the station to tell us True Blood’s highest ratings came from the Greensboro, NC market. As a thank you, from HBO and Time Warner, we get to host the True Blood Season 3 finale party! The evening will have red carpet coverage, a VIP reception, Q &A with members of the cast, then we will watch the season finale at the Carolina Theatre. It’s all going down next Sunday, September 12th. This event is invite only, but you can win tickets by listening to Rock 92 next week, being a fan on our facebook page, or through Time Warner Cable. This is going to be MAJOR and I am so grateful to be a part of it. My friends keep asking me if I’m nervous about meeting the stars and my answer is always no, I’m more nervous about finding the right outfit to the party! These stars are going to look all kinds of hot and I need to be on top of my fashion game right? Word on the streets, (streets being inside the studio of the radio station) is that the dress code is casual. I was so relieved to hear that because my first thought was “Where in the heck am I going to find some fancy dress in one week?” Instead I pieced together this look. 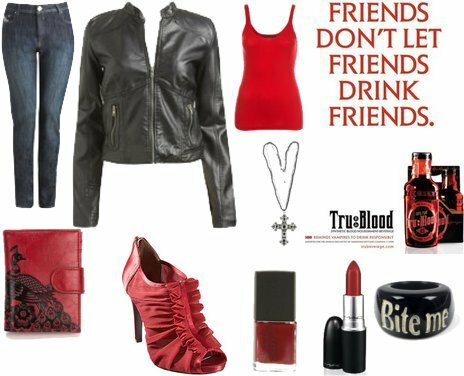 I think it is casual, and fun, with a bad girl vibe. I hope to see some of you there! Don’t forget to enter here for a chance to win tickets!